The Reef Octopus OCTO VarioS 6S DC Skimmer Pump is the latest in variable speed flow technology and allows for refined control, enhanced performance and efficiency. Replaces the Diablo 5500S Controllable RO-DC Skimmer Pump (RODC-5500S). Does not include the adapters. The Reef Octopus OCTO VarioS 4S DC Skimmer Pump is the latest in variable speed flow technology and allows for refined control, enhanced performance and efficiency. Replaces the Diablo 3500S Controllable RO-DC Skimmer Pump (RODC-3500S). Does not include the adapters. The Reef Octopus OCTO VarioS 2S DC Skimmer Pump is the latest in variable speed flow technology and allows for refined control, enhanced performance and efficiency. The Reef Octopus Aquatrance 1800S Skimmer Pump is a direct replacement pump for the newer skimmer models with LARGE grey threaded outputs. Replacement Controller for the Reef Octopus OCTO VarioS 6S DC Skimmer Pump. Does not include the float switch, mount or advanced control cable. Replacement Controller for the Reef Octopus OCTO VarioS 4S DC Skimmer Pump. Does not include the float switch, mount or advanced control cable. 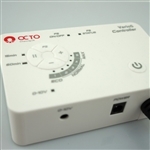 Replacement Controller for the Reef Octopus OCTO VarioS 2S DC Skimmer Pump. Does not include the float switch, mount or advanced control cable.